The Humboldt State University Third Street Gallery presents “A Holiday Exhibition: Affordable Art for the Season” and “Significant Moments: Works by JoAnne Berke” through Dec. 31. 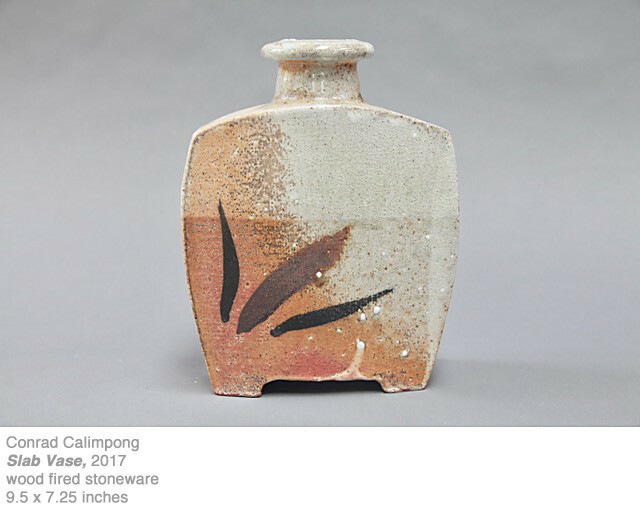 “Affordable Art” features 17 artists from California’s North Coast displaying prints, ceramics, sculpture, and paintings. The exhibition features artworks that are affordable and are suitable for the gift-giving season. Participating artists include Conrad Calimpong, Kit Davenport, Nancy Frazier, Amy Granfield, Alder Gustafson, David Jordan, Peggy Loudon, Jason M. Marak, Malia Matsumoto, Lush Newton, Scott North, Ted Okell, Lida Penkova, Meredith Smith, Gina Tuzzi, and Mark Young. “Significant Moments,” a solo exhibition of works by retiring HSU Art Education Professor JoAnne Berke, features a selection spanning from 1985 through the present. Works on paper, drawing, mixed media, paint, and mosaic will be on display. 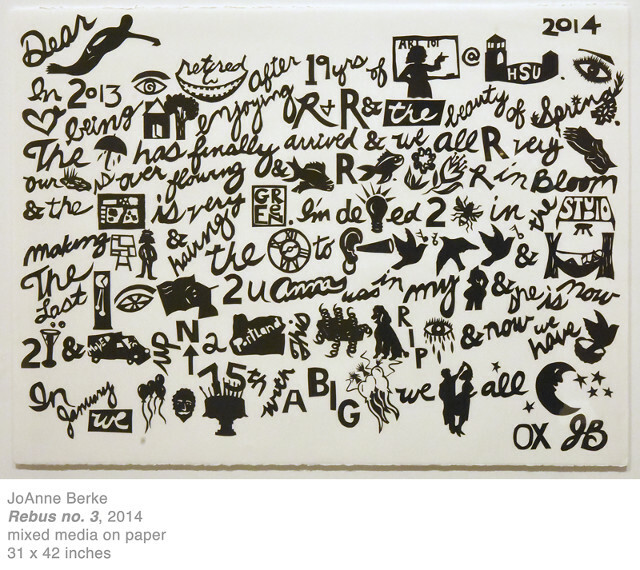 In Berke’s mixed media pieces, her penchant for incorporating the written word as a conceptual device that simultaneously provides a compositional structure for the work is on full display. Visitors to the gallery will also encounter mosaic and found object sculpture that range from absurd irony to somber beauty in tone. 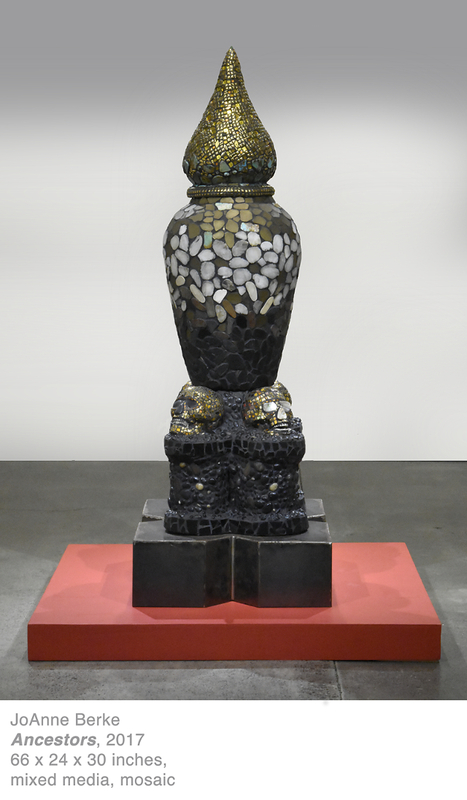 Two of these sculptures, “Seed Catcher,” 2009, and “Ancestors,” 2017, highlight Berke’s bravado mosaic technique as applied to architectural forms. “I think of this exhibition as a significant moment and the exclamation point to the end of a successful career of 45-years teaching art, and also perhaps, a time for my own rebirth as an artist,” says Berke. Both exhibitions run through Dec. 31. Third Street Gallery is located at 416 Third St., Eureka. Admission is free. The gallery is open daily from noon to 5 p.m. except for Christmas Eve and Christmas Day, when it will be closed. Those planning group tours are encouraged to call ahead. For more information call 707-443-6363 or visit the gallery website at humboldt.edu/third. In 2016, the Third Street Gallery was relocated and renamed after 19 years in its former location on First Street in Eureka. Students enrolled in HSU’s Art Museum and Gallery Practices Program participate in the daily management and planning of exhibitions at the gallery. The gallery provides real-life opportunities for the students to develop their gallery and museum skills, which in turn provides them with experience that will help them to enter the job market. Many students who have participated in the program have gone on to careers in museums and galleries throughout the nation.